Three Dimensional Computing may not appeal to everyone but it's coming sooner than you might think. It’s real and won’t make you dizzy. I’ve been able to mimic some advances using the evolutionary technology of my Nintendo Wii. Based on a code project by Johnny Chung Lee this display presents a 3D perspective that actually changes as I move my head. If I move closer, Scotty gets bigger. The following video will blow you away when you see how Nintendo Wii technology can be used to create a simple head tracking device to provide a true 3D perspective. 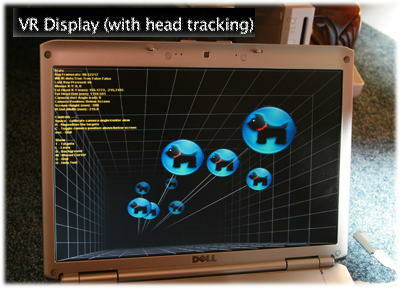 The possibilities of using head tracking goes beyond cool video games. I would love to be able to just look up or down to scroll the screen. Tilt my head and see behind a window? Perhaps when I finish up WinPatrol 2008 I’ll work on an applet that will provide head based scrolling thanks to starter code available from Johnny. Researchers at Stanford aren’t alone. Last year Adobe showed off its efforts to create a 3D lens. The real world possibilities for this type of technology are endless. Truly amazing! Thank you for being so freekin' smart. The day is fast approaching that the virtual world will have to be labeled "VIRTUAL," because we won't be able to perceive it from the actual one. Keep developing.